Blackjack Surrender 5 hand is played with 6 standard decks of playing cards with 52 cards in each. The ace is worth 1 or 11, 2 to 9 are taken at their face value and 10’s, Jacks, Queens and Kings are all worth 10. Once the cards have been dealt and tallied up, the player can then choose to Stand, Hit, Double or Split. 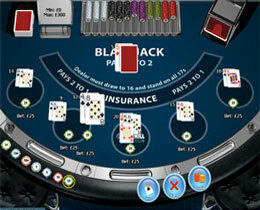 Players can have 5 active hands open simultaneously in Blackjack Surrender 5 Hand. If players feel they have a weak hand they may Surrender and will lose half the amount they bet. The Dealer has to draw 16 but must stand on 17. This is a game of skill as well as chance and if players have good strategies in place they stand a good chance of winning. Bets range from as little as $0.01 up to a maximum of $300 per hand.